At 8:00 on a Saturday morning in November, most of Columbia University’s students are still in their beds, sleeping off the week’s midterms, papers, and problem sets. Dance Studio 1 in Barnard Hall, however, is already full of activity, as eight members of Columbia Ballet Collaborative warm up for their morning rehearsal with choreographer Andrew Harper. With their Fall 2014 Performances quickly approaching, Harper and his cast are putting the finishing touches on new his work for CBC, one of six pieces set to premiere on November 15th at Manhattan Movement and Arts Center. CBC dancers in Andrew Harper’s piece. Photo by Andrea Arellano. In this morning session, Harper is coaching his dancers on how to combine the rhythm of his choreography with a rough and tumble attitude to achieve the perfect balance of urban nonchalance. Harper’s piece draws inspiration from Romare Bearden’s collages depicting African-American figures enacting scenes from Homer’s The Odyssey, and indeed the piece evokes a sense of personal journey. Given the age of this cast, the work also resonates with the idea of youthful angst, growing up, and learning that you don’t always need to be a tough to be someone important. Later in the afternoon, I dropped in to see Alison Cook Beatty rehearsing her trio Patience/Impatience with CBC dancers Holly Curran, Abby Ryckman, and Rachel Shafran. Cook Beatty fills the stage with a weights and ropes to create what resembles a giant game of cat’s cradle, and as the dancers are alternately tethered and released from this spiderweb, there’s an important subtext of frustrated womanhood. Aided by composer Avner Finberg’s abstract score, the work often evokes the spirit of the mid-century American modern masters. Abby Ryckman in Alison Cook Beatty’s “Patience/Impatience.” Photo by Andrea Arellano. In addition to Harper and Cook Beatty’s pieces, CBC’s Fall 2014 program will also include works by Nancy Cantine, Donald Borror, Richard Isaac, and Valentina Strokopytova. Though part of CBC’s appeal for students is its ability to commission new works from professional choreographers, each season’s program also includes at least one student choreographer. This fall’s program features three Columbia students: Borror is pursuing a MA at Teachers College, Isaac is completing a dual-degree program at the School of International and Public Affairs, and Strokopytova is a junior majoring in Environmental Policy at Barnard College. 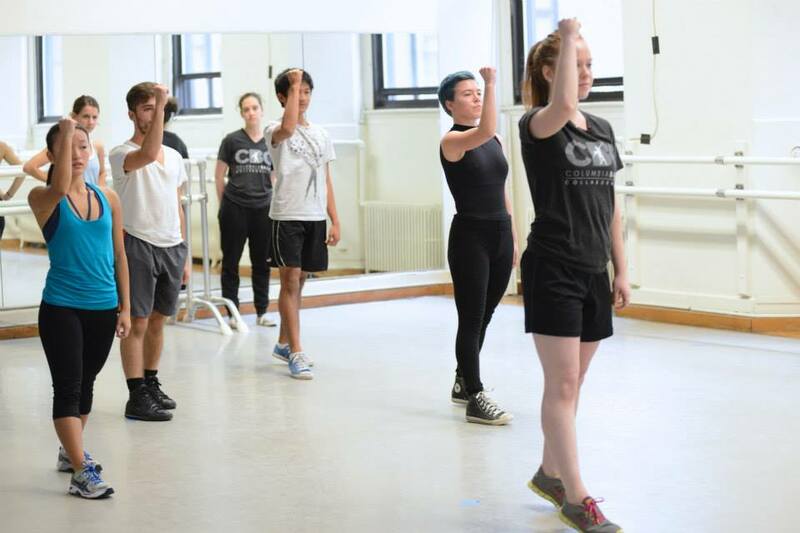 Now in its eighth season, the group has established itself on campus as the meeting place for student dancers and New York City’s professional concert dance scene. CBC’s members are enrolled in a wide variety of Columbia’s programs, from liberal arts undergrads to civil engineering post-bacs, and come from all walks of life: some are former professional dancers returning to school through Columbia’s School of General Studies, others are fresh out of high school and looking to perform in a professional environment. Regardless of backgrounds, these dancers come together every semester to perform a program of new ballet works, and ensure the vitality of contemporary ballet and concert dance in Columbia’s community. CBC dancers in Nancy Cantine’s piece. Photo by Andrea Arellano. Dance is quite popular on Columbia’s campus, thanks to the presence of Barnard College’s venerable Dance Department and a myriad of student groups. However, CBC is the only student-run group on campus that gives student choreographers an opportunity to produce an extended work (8-12 minutes) in a professional theater space. To be provided with a costume budget, a lighting technician, a marketing team, and free studio space (on top of a cast of talented, intelligent, and dedicated dancers) is something many emerging dancemakers in New York City can only dream of, and yet, CBC has found a way to make this possible. It’s an impressive endeavor, and a reminder of how student dancers are finding ways to thrive in the vast landscape of New York City dance. Visit CBC’s website to learn more about Columbia Ballet Collaborative’s dancers, choreographers, and organizational mission. Read more about CBC on Point of Contact.